More and more photographers are thinking of switching to a mirrorless camera – either abandoning the SLR systems they have used for years, or adding a new mirrorless model as their second camera. With smaller body sizes, faster frame rates, better video features and more, there are plenty of advantages to switching to mirrorless, but it's still a big leap for any enthusiast or pro to make. Digital Camera magazine teamed up with Olympus to give six DSLR-owning readers the chance to spend a full day trying out the professional-standard Olympus OM-D E-M1 Mark II for themselves, so they could see what using a top mirrorless model is really like. Olympus’s most advanced camera ever is made to meet the needs of the modern professional photographer. In a compact splash-proof body weighing just 564g, it packs a maximum burst rate of 60fps, a 20MP Live MOS sensor, built-in five-axis image stabilisation and 4K video. With focus and exposure locked, the OM-D can shoot at 60fps. Switch on AF and AE to track your the subject, and you can still shoot the action at an incredible 18fps. For still subjects and video, use the hybrid autofocus system; its 121 AF points stretch 75% across the frame. With C-AF, on-chip phase detection means you won’t miss a shot. Using the Micro Four Thirds lens mount, there are 24 M.ZUIKO zooms and primes to choose from to cover every subject – plus options from other manufacturers. To make it more interesting, we invited our photographers to take part in a series of 12 challenges in our Scavenger Hunt. 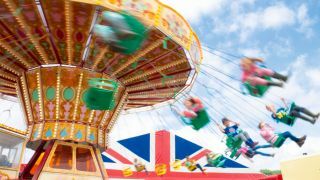 In the bustle and colour of a country show, our readers had to find a dozen images that best matched the themes we had set for them, with less than six hours to get their pictures back to editor-in-chief Chris George for judging. On hand was the Olympus support team, with a big roller bag full of M.ZUIKO Pro lenses to pick from. Let the hunt begin! What's a Photo Scavenger Hunt? A photo scavenger hunt works a lot like a regular treasure hunt, but instead of finding objects, each person is given a list of things to photograph. Joanne says: “I have had my Nikon D7000 for a while, but it is sometimes too much faff to get it out of the bag! I really enjoyed using the Olympus, as it’s very light. I am a Gavin Hoey fan: he uses an Olympus camera and the Scavenger Hunt was a lot like his 15-Minute Challenges that I watch on YouTube! “The fold-out touchscreen was useful to help avoid lying on the wet grass when using the 8mm f/1.8 Fisheye Pro lens. I used this to create my ‘Worm’s Eye View’ shot of the combine harvester, which I enhanced using the camera’s built-in Bleach Bypass Art filter. Mark says: “I work designing security camera systems during the week, but shoot events at the weekend. I’m off to shoot the Torquay Air Show tomorrow, and a steam fair the day after. Paula says: “I grew up on a farm, and we used to come and show sheep here when I was younger. One of the things I liked about this mirrorless camera is that you could see changes to EV compensation being applied in the electronic viewfinder. Sarah says: “I have been working as a photographer in a studio for a few years, but have just gone freelance. I have been looking for a second lightweight camera to supplement my full-frame Canon DSLR. The OM-D E-M1 Mark II makes my EOS 5D Mark III feel like a proper brick! Duncan says: “I had been considering upgrading to a full-frame Nikon, but have held back due to the weight and bulk of the cameras and lenses. What I liked about the Olympus is how the combination of the light weight, image stabilisation and articulated screen meant it was perfectly possible to shoot one-handed.